In a new book that was published posthumously, Stephen Hawking, who died in March, wrote that it is impossible for God to exist in our universe. From his desk at Cambridge University and beyond, Stephen Hawking sent his mind spiraling into the deepest depths of black holes, radiating across the endless cosmos and swirling back billions of years to witness time's first breath. He viewed creation as a scientist, and when he was called to discuss creation's biggest puzzles — Where do we come from? What is our purpose? Are we alone? — he answered as a scientist, often to the chagrin of religious critics. Hawking's answer — compiled from decades of prior interviews, essays and speeches with the help of his family, colleagues and the Steven Hawking Estate — should come as no surprise to readers who have followed his work, er, religiously. 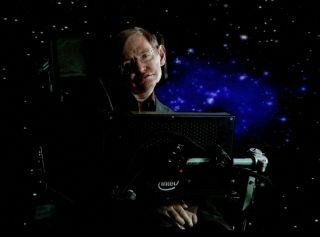 "I think the universe was spontaneously created out of nothing, according to the laws of science," Hawking, who died in March, wrote. "If you accept, as I do, that the laws of nature are fixed, then it doesn't take long to ask: What role is there for God?" "If you like, you can say the laws are the work of God, but that is more a definition of God than a proof of his existence," Hawking wrote. "Did God create the quantum laws that allowed the Big Bang to occur?" Hawking wrote. "I have no desire to offend anyone of faith, but I think science has a more compelling explanation than a divine creator." Hawking's explanation begins with quantum mechanics, which explains how subatomic particles behave. In quantum studies, it's common to see subatomic particles like protons and electrons seemingly appear out of nowhere, stick around for a while and then disappear again to a completely different location. Because the universe was once the size of a subatomic particle itself, it's plausible that it behaved similarly during the Big Bang, Hawking wrote. "The universe itself, in all its mind-boggling vastness and complexity, could simply have popped into existence without violating the known laws of nature," he wrote. That still doesn't explain away the possibility that God created that proton-size singularity, then flipped the quantum- mechanical switch that allowed it to pop. But Hawking says science has an explanation here, too. To illustrate, he points to the physics of black holes — collapsed stars that are so dense, nothing, including light, can escape their pull. Because the universe also began as a singularity, time itself could not have existed before the Big Bang. Hawking's answer, then, to what happened before the Big Bang is, "there was no time before the Big Bang." "We have finally found something that doesn’t have a cause, because there was no time for a cause to exist in," Hawking wrote. "For me this means that there is no possibility of a creator, because there is no time for a creator to have existed in." This argument will do little to persuade theistic believers, but that was never Hawking's intent. As a scientist with a near-religious devotion to understanding the cosmos, Hawking sought to "know the mind of God" by learning everything he could about the self-sufficient universe around us. While his view of the universe might render a divine creator and the laws of nature incompatible, it still leaves ample space for faith, hope, wonder and, especially, gratitude. "We have this one life to appreciate the grand design of the universe," Hawking concludes the first chapter of his final book, "and for that I am extremely grateful."